The date, about 4200 years ago, makes it hard not to think about the Indus civilization which had at least coastal seafaring. Could a single trading vessel, blown out of course and ending up in Australia, and it's crew and their pets be responsible for this? I was wondering if any linguistic trace of this migration exists in any Australian language. This might ultimately help us understand the linguistic situation in India- especially what languages were spoken there prior to Dravidian and Indo-Aryan- better. Dravidian probably was spoken in southern India already when this emigration happened and its current speakers of those languages who seem show closest genetic connection to aboriginal peoples of northern Australia. So, I would look for signs of Dravidian influence in the northern Australian languages when it comes to the technology and animals that have been also connected to this emigration. If anything remains of the immigrants' language, it would be found in those words most likely. This latest DNA evidence confirms some very old theories, theories which are denied by many modern-day liberal Australians in the name of political correctness. These Holocene immigrants correspond to the Dravidians in Rev. John Mathew's trihybrid theory from 1889, and to the Carpentarians in Joseph Birdsell's trihybrid theory from 1941. "The date, about 4200 years ago, makes it hard not to think about the Indus civilization which had at least coastal seafaring". And also hard not to think of the Austronesian expansion from the Philippines out into the Pacific that started around that time. A huge interconnection of various populations? "This also indicates that Australians and New Guineans diverged early in the history of Sahul, and not when the lands were separated by rising sea waters around 8,000 years ago". To me the haplogroup evidence has always indicated totally separate colonisations with a relatively small later overlap. Oz is mostly Y-DNA C whereas New Guinea C2 seems to be not original but associated with a later movement from Southern Wallacea. New Guinea is mainly Y-DNA F-derived, especially M and S. Y-DNA K-M9 is basically the only shared Y-DNA. The mt-DNA situation is a bit confusing as I've seen conflicting patterns published. But basically New Guinea has mt-DNA M-derived Q while Oz has N. R-derived P is shared but P looks most likely to have originated in Australia and more recently expanded to both Melanesia/New Guinea and to the Philippines. "Their findings suggest substantial gene flow from India to Australia 4,230 years ago. i.e. during the Holocene and well before European contact". What their findings suggest to me is that anyone looking for simple 'Garden of Eden' expansions is barking up the wrong tree. The true situation is far more complicated than anyone has so far been able to imagine. That explains Y K* in Australia. "I was wondering if any linguistic trace of this migration exists in any Australian language." Both Australian and South Asian languages have retroflex consonants (pronounced with the tongue tip curled back), which are rarely found anywhere else. A vestige of this migration? From Young's coverage, I gather this South Asian ancestry is restricted to Australian Aboriginals. I recall that paper on the whole genome of an Australian Aboriginal noted shared ancestry between their sequenced genome and South Asians, but the Papuans did not have this ancestry. Since Young notes this ancestry is too consistent in the recent paper's North Australian samples, it is not recent European admixture. I think this could be West Eurasian ancestry-via-South Asia in these people. Why else would he mention Europeans? I guess we will have to wait and see. I was wondering if any linguistic trace of this migration exists in any Australian language. "There is an approximate geographic correspondence between the Carpentarian immigration wave postulated by Birdsell (1977; sec. 7.3) and the non-Pama-Nyungan languages, and between the Murrayian wave and the Pama-Nyungan languages." It would be difficult to differentiate the secondary influence from the Indonesian. Modern Indonesian language contains many Sanskrit words, e.g. I would look for signs of Dravidian influence in the northern Australian languages when it comes to the technology and animals that have been also connected to this emigration. These Holocene immigrants to Australia (Carpentarians) were Veddoid, so they would have spoken a language related to the parent Vedda language, not Dravidian. They might have been driven from India toward Australia by the Dravidian-speaking Caucasoids of the Indus Valley Civilization pushing further south into the Indian peninsula. No. The earlier Murrayians were K. The people whose genetic signature was detected in this paper, the Carpentarians, were C.
disease of epidemic proportions that wiped out earlier Aboriginal populations. Just like American Indians got wiped out by Europeans. May be same process wiped out Neanderthals. "Their analyses also reveal a common origin for populations from Australia, New Guinea and the Mamanwa – a Negrito group from the Philippines – and they estimated that these groups split from each other about 36,000 years ago." It's probably noted in the paper, but I'll point out here that these are the same three groups which were found by Reich and Stoneking to have Denisovan admixture, as opposed to the Andamanese and Malaysian Negritos, who they found to have no significant Denisovan admixture. The Jomon of Japan also have similar origins to Philippine Negritos and Australian Aboriginies. prior to the divergence of the Native American population from the East Asian population. By fst, the ASI component is most related to present day South East Asian populations (it forms a clade with Andamanese, but is not closer to them, per Reich). Does this add to that or is it an alternate explanation? This work found the same conclusion based on chromosome Y: http://www.sciencedirect.com/science/article/pii/S0960982202007893 already in 2002. As for dingo, its origin is more probably in east Asia than in India. The Murrayians, who preceded the Carpentarians, were related to the Ainu. These results explain why the Reich et al. Australian Aboriginal samples exhibit a little above 10% South Asian admixture according to ADMIXTURE analyses whereas New Guineans and Melanesians show no South Asian admixture according to the same analyses. If it is K* it may not be ASI. If Papua showed south Asian presence why not new Guinea?. Why Papua and New Guinea have different major Types Between Y-M and Y-S?. Instead of India It can be any of south Asian origin. Tasmanoids = Negritoids [more specifically, Andamanoids]. The Veddoids (who became Carpentarian) came, of course, from India, but the surprise is that they came so recently. Maybe this migration was in addition to an earlier migration that brought most of the Veddoids to Australia. Regarding Denisovan admixture: it is supposed to be strong in Australians and Papuans, but not in western Negritos (the Andamanese and the Malayan Negritos). Now the big question I have, to which I have been unable to find a clear answer, is: do the Veddoids have levels of Denisovan admixture comparable to those of Australians, or not? If they do, it would suggest that the Denisovans mixed with the Veddoids/Carpentarians, but not with the western Negritos, accounting for the signs of the mixture in India, Australia and New Guinea (where the Carpentarian component was present as a minority), but not in the western Negritos. But if the Veddoids do not have these relatively high levels of Denisovan admixture, it would suggest that the Denisovan v. non-Denisovan divide is not between the Carpentarian and Andamanoid clades, but between easterners and westerners, the Denisovans mixing with the eastern branches of both of these two clades, but not with the western branches. "That explains Y K* in Australia". I suspect so. And in New Guinea. "The earlier Murrayians were K. The people whose genetic signature was detected in this paper, the Carpentarians, were C". Do you have any confirmation of that? I understood that K was more common in the northeast and C4 was idespread through Australia. "The Jomon of Japan also have similar origins to Philippine Negritos and Australian Aboriginies". Possibly, but not widely accepted. "If Papua showed south Asian presence why not new Guinea?". Where is that distiction between the two made? Usually in this sort of thing 'New Guinea' means the whole island and 'Papuan' means the people of that island. The situation may be somewhat complicated by the fact that we today have a region officially called 'Papua New Guinea', as distinct from the eastern end of the island called 'Irian Jaya'. Papua was originally the eastern part of the island south of the central mountain range and New Guinea north of that range. "Why Papua and New Guinea have different major Types Between Y-M and Y-S?". I see here that you are using 'Papua' as meaning Melanesia, the islands off the north coast of New Guinea. Yes, Melanesia and new Guinea tend to have distinct basal members of MNOPS. S tends to be mainland New Guinea, especially in the Highlands, while M is coastal and offshore islands, but including the swamp jungle south of the central mountain range, presumably mainly along the rivers. "It was TERRYT who mocked me for saying that their was migration from India to Australia". "Some aboriginal Australians can trace as much as 11% of their genomes to migrants who reached the island around 4,000 years ago from India"
Does 11% mean all of the others came from India as well? "this suggests that male K Murrayans killed off the Negrito males (presumably D or a descendant) and married their widows, and later M evolved from K in their descendants, or that M had already evolved from K and male M Murrayans killed off the Negrito males and married the widows." The Murrayians were Ainu-like, but in light of the recent autosomal studies on the Ainu it's not accurate to describe the Ainu as "archaic Caucasoid". They were actually archaic Mongoloid. The Ainu were what East Eurasians looked liked before the evolution of the typically Mongoloid traits. There is, however, some small element of truth in the old "archaic Caucasoid" description: As you go increasingly further back in Mongoloid evolution, there will be an increasing resemblance to the common ancestor of both Caucasoids and Mongoloids, and this ancestor was both "archaic Caucasoid" and "archaic Mongoloid" in its traits. "The Tasmanians represent a dihybrid race whose predominant genetic element is not Negrito, but on the contrary represents the Murrayian Australian type from the south-eastern portion of that continent. The Oceanic Negritic element is clearly present but … a comparison with the Andamanese indicates that the Negritic element in the Tasmanians must have been the minority contribution." The Veddoids (who became Carpentarian) came, of course, from India, but the surprise is that they came so recently. Birdsell estimated that the Carpentarian expansion took place 15,000 years ago. He got that wrong, but that's understandable because, unlike the Barrineans and Murrayians, the Carpentarians left no archaeological remains for him to base his date on. Now the big question I have, to which I have been unable to find a clear answer, is: do the Veddoids have levels of Denisovan admixture comparable to those of Australians, or not? They don't. See this map from the 2011 paper by Reich and Stoneking. Dravidians (who have a lot of Veddoid ancestry) had the least Denisovan ancestry of all the populations they studied (none of statistical significance). The map shows that there's no statistically significant Denisovan ancestry as far east as Sumatra and Borneo, and that the furthest west that statistically significant Denisovan ancestry is found is Flores. No populations from Java, Bali, Lombok, or Sumbawa were tested. Now this dividing region is very interesting, because Java is where all of the Southeast Asian Homo erectus fossils were found, and Flores is where Homo floresiensis was found. I have to believe that there was some kind of relationship between Denisovans and erectus and/or floresiensis. The paper argues that Denisovans inhabited a huge range extending from the Altai to Indonesia, but that map suggests to me that there was a dense inhabitation somewhere in the dividing range, and very sparse, scattered populations elsewhere, with Denisova Cave being only a distant, isolated Denisovan outpost. So as the Barrineans, Murrayians, and Carpentarians passed through the dividing range, they could have exchanged genes with whatever Denisovan-like things were living there. We know that at least one of those groups did. The questions that remain to be answered are whether more than one of those groups did, and which of those groups did. Saying that the Indian ancestry found in Australia explains the K in Australia just doesn't logically work, because K is also found in New Guinea, and yet no Indian ancestry was found in New Guinea. As far as I can tell, K and C are both widespread throughout Australia, which would mean that 4000 years was sufficient for the thorough interdiffusion of the Murrayian and Carpentarian elements. Popular scientific opinion on racial matters these days is just about worthless. The abstract of the paper we're commenting on tells us that "It is commonly assumed that Australia remained largely isolated following initial colonization" and mentions "the prevailing view that there was no contact between Australia and the rest of the world" before European contact. Now the truth is that there was never any scientific evidence for those views. They were a dogma backed up only by liberal, politically correct nonsense. Physical anthropologists like Birdsell working out in the field had figured out long ago what the latest DNA studies are now "discovering". The physical similarities that Birdsell observed between the more Murrayian Australians and the Ainu are no less real than those that he observed between the more Carpentarian Australians and the Veddoids of India. I find the comment on y-haplogroup D intriguing. Have there ever been any remnants of D found in the region? I am a proponent of the idea that D was the very first wave of AMHs into S and E / SE Asia. As to the Denisovan "dividing line", an alternative explanation is the Toba supervolcano event. The AMH population in that region and E / SE of it could have been a highly admixed one from whatever migration route they had taken (even North India is possible). When much of that population was replaced after the event, it was from a different wave of migration, with no admixture (Denisovans were long gone). There is the idea floating around that Denisovans themselves were "hybrids" (e.g., heidelbergensis and erectus) - I think we should soon have a definite answer on that. That would clarify a lot. Southern migration theory has lot of opposition. But other migration theories has no validity or even small amount of proof. Bloggers blog about Noah, Bharat varsha, Out of America, Out of Wallacea etc. etc. they are just pipe dreams when it come to scientific proof. "Saying that the Indian ancestry found in Australia explains the K in Australia just doesn't logically work, because K is also found in New Guinea, and yet no Indian ancestry was found in New Guinea". True to some extent. But K-M9 is not especially common in New Guinea, being more an Australian haplogroup with presence in the Admiralty Islands. It also reached Fiji either with or some time after the Austronesians arrived there. Most K-M9 in New Guinea may in fact be K2, also found in Australia. In fact the only Indian K is K1 as far as I'm aware. And it is very rare. K4 has been found in Bali and K3 is reasonably common in the Pacific islands and in the Bismark Archipelago, where it presumably originated. All this would support the notion that K(xLT) has a Wallacean origin. Interestingly MNOPS is part of K(x(LT). With K1 being found in South Asia what we're seeing here may be a movement in the other direction, from Australia to South Asia. The dingo is a separate issue. "I find the comment on y-haplogroup D intriguing. Have there ever been any remnants of D found in the region?" D has never been found east of Wallace's Line. And the D found anywhere near that line is the derived D1, which is quite possibly from Tibet. D is also not found in India except as D1 in Tibeto-Burman-speaking groups of the far northeast, so is most likely a recent immigrant there as well. D2 is Japanese, presumably Ainu, and D3 is Central Asian. Andaman Island D is shown simply as D* although is possibly a single haplogroup within D.
"I am a proponent of the idea that D was the very first wave of AMHs into S and E / SE Asia". Seems unlikely in light of the above. It may have been early to Central Asia though. "As to the Denisovan 'dividing line', an alternative explanation is the Toba supervolcano event". Not the only explanation possible though. The expansion southward of the Mongoloid phenotype would explain its extinction west of Wallace's Line. "So far no other theory is proven Southern migration theory has lot of opposition. But other migration theories has no validity or even small amount of proof". It is very difficult to fit Y-DNA D with any sort of 'Southern migration theory'. "I find the comment on y-haplogroup D intriguing. Have there ever been any remnants of D found in the region? I am a proponent of the idea that D was the very first wave of AMHs into S and E / SE Asia." Y-DNA haplogroup D is found in Japan, the Andaman Islands, Tibet (home to the most basal subtypes of Y-DNA D today), and at more residual frequencies in Southern India and Northeast Asia. It is entirely absent in the intervening areas of Asia, Southeast Asia (including island Southeast Asia), from Papuans and from Australian aborigines. The branching structure of the phylogeny shows that the Andaman branch is intertwined with the South India and Tibet part, with the Northeast Asian part looking like it is derived from Tibet, while the Japanese branch is a deep rooted division from the rest of the phylogeny. The Japanese Jomon population can't be older than 30,000 years BP as a distinct population (about 15,000 years after the Papuans and Australian aborigines arrived). The mostly likely point in time for the settlement of the Andamans was 20,000 years ago during the Last Glacial Maximum when the journey by sea was least daunting (and the lack of genetic diversity among indigeneous Andamanese suggests a very small founding population for them). 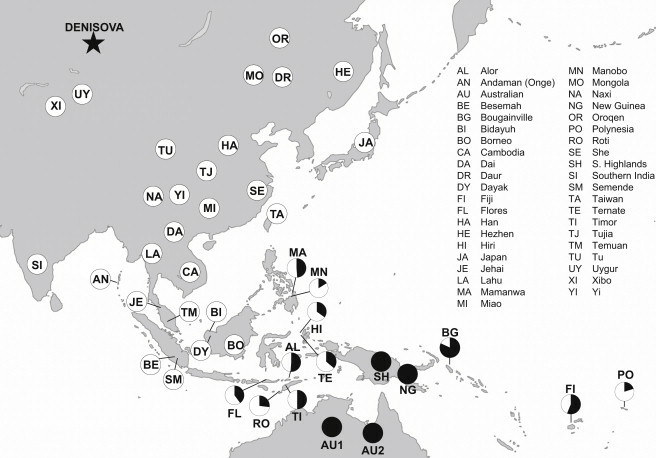 No Y-DNA D populations have Denisovan admixture, while Papuan and Australian aboriginal do have Denisovan admixture (and it isn't impossible that Papuan-like peoples to the West of the Wallace line were wiped out by an influx of newcomers during the LGM when the area was connected by land to mainland Asia. The archaeological evidence from Tibet points to a modern human presence only a little before the LGM (perhaps 24 kya). The earliest Y-DNA D populations in Japan and Tibet appear to originally have had exclusive mtDNA M female counterparts, far less diverse than Papuan or Australian populations. Y-DNA D shares a clade with the African centered Y-DNA E that has a deep rooted separation from the CT Y-DNA clade that accounts for all other Eurasian Y-DNA haplogroups. As a whole, this evidence points strongly to the notion that Y-DNA D was not a first wave out of Africa or Out of Arabia migration, but instead as a fairly minor secondary wave of migration ca. 10,000-15,000 years later into spaces that nobody else occupied by a population from a fairly basal branch of what would become Y-DNA haplogroup E, probably one with superior maritime capabilities to other modern humans at the time. The D as first wave theory is a poorer fit for this and requires the genocide of that population in SE Asia and East Asia to be extremely thorough, which there isn't much precedent to support at the huge geographic scope. How could Denisovan, Neanderthal and Cro-Magnon DNA survive at appreciable proportions in modern populations, yet fellow modern human Y-DNA D be so completely wiped out over such a huge swath of territory in the Upper Paleolithic by smallish wandering tribes of hunters and gatherers? Why would ancient admixture with Asian hominins be found only in a secondary wave population? It doesn't ring true. Have there ever been any remnants of D found in the region? It's found in Malaysia, Sumatra, and Borneo, but not in Java or points further east. I am a proponent of the idea that D was the very first wave of AMHs into S and E / SE Asia. The DE* found in Tibet shows that the first wave was DE, and that D later evolved somewhere in or around South Asia. As to the Denisovan "dividing line", an alternative explanation is the Toba supervolcano event. It's more parsimonious, and more consistent with the available archaeological evidence, to suppose that AMHs had not gotten any further east than India at the time of the Toba eruption, and that they headed into Southeast Asia within a few thousand years after it, encountering something related to Denisovans in the dividing region. "As far as I can tell, K and C are both widespread throughout Australia"
Any reference for that? The only information I have is what Ebizur provided at Maju's blog some time back. He only differentiated between Arnhem and the desert but K-M9 made up 30% in Arnhem but only 17% in the desert. It would surely be surprising if both haplogroups are evenly distributed through a continent. The only case ever I would think. "Y-DNA haplogroup D is found in Japan, the Andaman Islands, Tibet (home to the most basal subtypes of Y-DNA D today), and at more residual frequencies in Southern India and Northeast Asia". "D-M174 (Without Positive Tested Subclades)This paragroup is found with high frequency among Andaman Islanders and 0%-65% in Northeast India in adivasi tribes". "This study reports, for the first time, high frequencies (8–65%) of Y Alu polymorphic (YAP) insertion in northeast Indian tribes. ... YAP insertion frequencies reported in the mainland Indian populations are negligible, according to previous studies". "The mostly likely point in time for the settlement of the Andamans was 20,000 years ago during the Last Glacial Maximum when the journey by sea was least daunting"
And lowered sea level, another factor making the journey less daunting. "it isn't impossible that Papuan-like peoples to the West of the Wallace line were wiped out by an influx of newcomers during the LGM when the area was connected by land to mainland Asia"
I would place the wiping out as being a bit more recent. The arrival of Mongoloid phenotype from further north associated with the expansion of Early Neolithic from the Yangtze and Yellow Rivers. Earlier haplogroups such as C and K do survive though. In fact the wiping out is ongoing as demonstrated in East Timor and Irian Jaya. "As a whole, this evidence points strongly to the notion that Y-DNA D was not a first wave out of Africa or Out of Arabia migration, but instead as a fairly minor secondary wave of migration ca. 10,000-15,000 years later into spaces that nobody else occupied by a population from a fairly basal branch of what would become Y-DNA haplogroup E"
Agreed, although the 'superior maritime capabilities' seems unlikely as they didn't cross Wallace's Line. Thank you for the information regarding Denisovan admixture in Veddoids. I am glad my earlier comments were helpful to you. I agree with most of what you say. However, I have some reservations on the treating of Ainus as proto-Mongoloid, except in the sense in which the Caucasoid race in general is ancestral to the Mongoloids, and Ainus may be near the Caucasoid base. Also, are you using Barrinean as a synonym for “Tasmanoid”? What is the evidence that the earliest D males had only M female companions? I would expect both M and D companions, though M only is not shocking. As to the view that the first migration had D males, I am not committed to the view that this migration was first rather than second, but I don’t find the objections you make to the former compelling. It seems that they were probably hunter-gatherer bands, easily wiped out by others and/or by natural disaster and/or by troubles finding enough food. No, it's just true, unqualifiedly. He said that the Indian ancestry in Australia explains the K* in Australia. You agreed, and said that it also explains the K* in New Guinea. But there is no Indian ancestry in New Guinea. Including its descendants M and S, almost three quarters of the Y chromosomes in New Guinea are K.
All this would support the notion that K(xLT) has a Wallacean origin. So humans moved from Africa to India to a few tiny islands in Indonesia, evolved K(xLT), and then went all the way back to mainland Eurasia so they could evolve NO, N, O, P, Q, and R. Do you realize how ridiculous this sounds? What really happened is that K(xLT) evolved in India, and all of its descendants radiated outward from there. Interestingly MNOPS is part of K(x(LT). With K1 being found in South Asia what we're seeing here may be a movement in the other direction, from Australia to South Asia. The opposite of what really happened. Oceania is a backwater. It's a population sink, not a population source. It's where a bunch of primitives resided while all of the evolutionary action was taking place in mainland Eurasia. D is also not found in India except as D1 in Tibeto-Burman-speaking groups of the far northeast, so is most likely a recent immigrant there as well. Wrong. Wikipedia on D*: "This paragroup is found with high frequency among Andaman Islanders and 0%-65% in Northeast India in adivasi tribes." CF didn't even exist until around 10,000 years after DE came into being. This explanation doesn't work, because there's still plenty of pre-Mongoloid genetic material in mainland Southeast Asia. No, it isn't. D is a relict haplogroup. The only places it's found today are those that nobody else later wanted. 50,000 years ago the picture was much different. "Oceania is a backwater. It's a population sink, not a population source. It's where a bunch of primitives resided while all of the evolutionary action was taking place in mainland Eurasia". Wow. One of the most racist comments I've ever read on this blog. "Including its descendants M and S, almost three quarters of the Y chromosomes in New Guinea are K". Sorry, I actually meant unresolved K*-M9. In effect K(xK1,K2,K3,M,NO,P,S). Virtually all New Guinea K is resolved into one of the derived haplogroups. "What really happened is that K(xLT) evolved in India, and all of its descendants radiated outward from there". Doesn't seem likely to me. "So humans moved from Africa to India to a few tiny islands in Indonesia, evolved K(xLT), and then went all the way back to mainland Eurasia so they could evolve NO, N, O, P, Q, and R". Pretty much, although MNOPS didn't move far into Eurasia before evolving into NO and P.
"there's still plenty of pre-Mongoloid genetic material in mainland Southeast Asia". I agree. It hasn't been entirely replaced. Yet. "Wikipedia on D*: 'This paragroup is found with high frequency among Andaman Islanders and 0%-65% in Northeast India in adivasi tribes'." "One concentration lives in a belt along the Himalayas stretching through Jammu and Kashmir, Himachal Pradesh, and Uttarakhand in the west, to Assam, Meghalaya, Tripura, Arunachal Pradesh, Mizoram, Manipur, and Nagaland in the northeast. In the northeastern states of Arunachal Pradesh, Meghalaya, Mizoram, and Nagaland, more than 90% of the population is tribal". "Linguistically the whole region can widely be distinctly differentiated into two portions: one region is characterised by speakers of Asamiya or Assamese which is written and spoken in Assam Valley and other parts and indeed one of the most recognised and established language systems that dates back to 900 CE and traces its origin from Charyapada; the other region which essentially includes the rest of the states with a preponderance of Tibeto-Burman languages". "The easternmost of Indo-European languages; it is spoken by over 13 million native speakers". How many of them carry Y-DNA D? "CF didn't even exist until around 10,000 years after DE came into being". And you are sure of that because ...? "D is a relict haplogroup. The only places it's found today are those that nobody else later wanted. 50,000 years ago the picture was much different". I agree it's a relict haplogroup. In fact its closest relation is African. At some time DE has obviously expanded either into or out of Africa to be later reduced to just an African and an East Asian refuge population. Your proposition seems to be that they became a relict haplogroup by a later expansion of humans not carrying the DE haplotype. Possible, but many haplogroups survive in regions later over-run by another population. On the other hand Neanderthal Y-DNA is no longer with us. To me their isolation in remote East Asian regions is as likely to be the product of climate cooling as it is of other human expansions. So D is not found in a region that nobody else later wanted. They were pushed there through climate cooling, and did not expand very much when conditions improved, except into Tibet and across the water to the Andamans. But DE's absence through much of the region where it had originally lived may have facilitated the later expansion of a different haplogroup suite when the climate warmed though. The fundamental movement was carried by haplogroups whose origin realistically can only be in SE Asia, or even Wallacea: members of MNOPS. But other haplogroups were carried along too. MNOPS's ancestor had earlier entered SE Asia through South Asia. For some reason they were able to backtrack through the contemporary South Asian population, dropping descendants along the way. That is the only scenario I can see that explains the geographic distribution of every haplogroups. The character limit forced me to split this into two parts. False. It's found in Malaysia, Sumatra, and Borneo. The Japanese Jomon population can't be older than 30,000 years BP as a distinct population (about 15,000 years after the Papuans and Australian aborigines arrived). "The authors also estimate the age of the unique Japanese haplotype D2-M57 as 37,000 years, which suggests that this first wave of migration brought people to Japan before the date of the earliest archeological evidence at 30,000 years ago. Tibetan settlement apparently predates that of Japan. The origin of the Tibetan D-M174 sublineage is older (52,000 years ago) and the Tibetan population also has a higher genetic diversity, indicative of earlier settlement." "In the 1960s Tategahana, Nojiriko in central Japan, was reported as a Paleoloxodon naumanni and Sinomegaceros yabei kill site with many small chipped stones made of various raw materials and bone/tusk tools made of Paleoloxodon and Sinomegaceros." "Based on AMS 14C dating on molars, antlers and wood from the ten stratified layers, the calibrated age range is between 47 ka to 31 ka (Geology Research Group for the Nojiri-ko Excavation 2004)." Sea levels were lower than today during the entire last glacial period, from 110 to 12 ka. If humans were able to make it from Sunda to Sahul 50,000 years ago, then there's no reason why they couldn't also have made it to the Andamans at the same time. Of course not, because there's no D east of the dividing region. It is impossible that they were completely wiped out, because there's still Papuan-like genetic material well to the west Wallace's Line. The archaeological evidence from Tibet points to a modern human presence only a little before the LGM (perhaps 24 kya). See the quote above. The Tibetan D sublineage is far older than that. The carriers of that lineage were driven up into the mountains by others who displaced them from their Northeast Indian homeland. "Ancient DNA recovered from 16 Jomon skeletons excavated from Funadomari site, Hokkaido, Japan was analyzed to elucidate the genealogy of the early settlers of the Japanese archipelago." "Haplogroups D1a, M7a, and N9b were observed in these individuals, and N9b was by far the most predominant." The diversity in Papuans and Australians is due to the fact that those populations have received multiple waves of immigration. Considering that DE originated about 10,000 years before CF did, I seriously think not. What actually happened is that CT left East Africa, DE evolved in India, D evolved in Northeast India, D expanded east, and then the more highly-evolved CF carriers came in and massively outcompeted D, leaving it with the spaces that nobody else wanted. And by the way, how is it that the people with the superior maritime capabilities are the ones who didn't make it east of Wallace's Line? The D as first wave theory is a poorer fit for this and requires the genocide of that population in SE Asia and East Asia to be extremely thorough, which there isn't much precedent to support at the huge geographic scope. The whole process of evolution is about some groups outcompeting others, even to the point of extinction. There's no telling how many Y lineages have gone extinct over the course of human evolution. How could Denisovan, Neanderthal and Cro-Magnon DNA survive at appreciable proportions in modern populations, yet fellow modern human Y-DNA D be so completely wiped out over such a huge swath of territory in the Upper Paleolithic by smallish wandering tribes of hunters and gatherers? First, the "swath of territory" isn't as "huge" as you've said it is. Second, the example of archaics actually undermines your position. Just as archaic autosomal DNA persists while archaic Y-DNA and mtDNA are extinct, in some places Negritoid autosomal DNA persists while Negritoid Y-DNA is extinct. Third, how hard do you really think it would have been for more evolutionarily-advanced, normal-height, Ainoid K males to extirpate primitive, tiny, Negritoid D males? Why would ancient admixture with Asian hominins be found only in a secondary wave population? The autosomal DNA of the primary Negritoid wave still exists in conjunction with the Denisovan-like DNA. It's the Negritoid Y-DNA that's disappeared. "False. It's found in Malaysia, Sumatra, and Borneo". You're misrepresenting the evidence here. It is 'found in Malaysia, Sumatra, and Borneo' but in the form of derived D1 so it is a relatively recent arrival there. And it is certainly not found any further east. "Sea levels were lower than today during the entire last glacial period, from 110 to 12 ka. If humans were able to make it from Sunda to Sahul 50,000 years ago, then there's no reason why they couldn't also have made it to the Andamans at the same time". But there is no evidence that they did so, in fact much evidence to the contrary. My only disagreement with Andrew would be that I think they arrived in the Andamans at the height of the most recent ice age, more recently that 20,000 years ago. "The Tibetan D sublineage is far older than that. The carriers of that lineage were driven up into the mountains by others who displaced them from their Northeast Indian homeland". again you are misrepresenting the evidence. Northeast Indian D is downstream from Tibetan D, not an ancestral form. "False. The most frequent mtDNA haplogroup in present-day Ainu is Y, which is descended from N9". I agree with you on that. N9 is a northern mt-DNA. Some downstream clades have moved south more recently though. "And by the way, how is it that the people with the superior maritime capabilities are the ones who didn't make it east of Wallace's Line?" I have always accepted that the ones who made it beyond Wallace's Line were exactly those with superior maritime capabilities at the time. To me the haplogroups need to be interpreted with that in mind. What haplogroups are yoyu suggesting had superior maritime capabilities at the time? "The whole process of evolution is about some groups outcompeting others, even to the point of extinction". You really are trapped in a Victorian attitude towards evolution. Complete genocide has rarely been achieved. Slow extinction is the more usual scenario. "There's no telling how many Y lineages have gone extinct over the course of human evolution". Obviously Neanderthal ones have become extinct. "hard do you really think it would have been for more evolutionarily-advanced, normal-height, Ainoid K males to extirpate primitive, tiny, Negritoid D males?" So now Y-DNA D is Negrito? What makes you so sure of that? As far as I'm aware it is unknown in any Negrito groups. "Haplogroup D-M15 is widely distributed throughout populations that dwell to the northwest, north, northeast, east, and southeast of the Himalaya. It is not found among the populations of India to the south and southwest. The distribution of Haplogroup D1 in Southeast Asia is also very limited, as it is found there only at low frequency and only among populations that speak Tibeto-Burman or Miao–Yao languages, which have ancestral ties to the north". "A dramatic spike in the frequency of Haplogroup D-M15 occurs as one approaches the Qinghai-Tibetan Plateau of western China: among some local populations in Qinghai, it has been found to reach as high as 100%. Its frequency gradually fades as one travels south through the territory of the Tibetan peoples, as Haplogroup O3, which is the most common haplogroup among the Han Chinese and also generally found among Southeast Asian populations, becomes dominant". "As for the ultimate origin of Haplogroup D-M15, one can only speculate that it might share a recent common ancestor with other members of the greater D-M174 lineage who have not tested as part of another branch. Such are are found at a low frequency among modern populations of Central Asia". "So humans moved from Africa to India to a few tiny islands in Indonesia, evolved K(xLT), and then went all the way back to mainland Eurasia so they could evolve NO, N, O, P, Q, and R. Do you realize how ridiculous this sounds?" 62/957 = 6.5% MNOPS*-M526 [3/9 = 33.3% Timor, 9/28 = 32.1% Alor, 5/30 = 16.7% Moluccas, 4/54 = 7.4% Mandar from Sulawesi, 24/394 = 6.1% Flores, 14/350 = 4.0% Sumba, 3/92 = 3.3% Lembata]"
MNOPS here excludes haplogroups M, NO, P and S. Where else do we find MNOPS? That is not a rhetorical question. "D is a relict haplogroup." Good to see people finally agreeing with me - I have stated as much for many, many years. However, when I mention it, I am rather serious: there are many indications that DE is slightly older than CF. In my view DE, and thus D, is a somewhat unsuccessful remnant population not of recent times, but of the first wave of AMHs out of Arabia. The familiarity of climate and fauna would have driven the first AMHs northward along the-then green Thar desert rather than proceeding into tropical, unfamiliar, and outright dangerous parts of India. The Andaman islands are a tiny offshoot that could have happened almost any time (see mt-DNA B on Nicobar). The carriers of that lineage were driven up into the mountains by others who displaced them from their Northeast Indian homeland. While I don't agree with your oversimplified race theories, I agree with some of your statements and think that (i) DE/D was the first wave, (ii) it might have followed a northern route - following the Indus river from its mouth, then the plains just south of the Himalayas, and then got stuck for a while at the dead end of the Brahmaputra river. Eventually, carriers made it to Yunnan, Sichuan, and Japan, and also to Nepal and further south to the Andaman Islands. Most importantly, many were wiped out by Toba, then by newly arriving CF, and finally driven to remote locations with the arrival of rice farmers (except where they accepted that life style). Why earliest? When looking at human y-DNA haplogroups, one can trace major migration paths (not necessarily some details) for pretty much all of the past - the more recent, the better. G,H, IJ, L, T etc. all have left traces. The only plausible explanation for no traces for D(DE) is that it happened incredibly early - so all traces got wiped out. However, I don't think CF came all that much later (might still have been pre-Toba), and I don't think CF looked physically all that different, initially (before 50,000 - 60,000 years ago). "The Andaman islands are a tiny offshoot that could have happened almost any time"
Almost certainly long after any southern coastal migration. Perhaps as recently as the Toalean, a sort of precursor to the Hoabinhian. The only links to 'Toalean' I can find are in books unfortunately. "think that (i) DE/D was the first wave, (ii) it might have followed a northern route - following the Indus river from its mouth, then the plains just south of the Himalayas, and then got stuck for a while at the dead end of the Brahmaputra river". Doesn't reaaly fit unless you're going to postulate some sort of genocide. In effect D is unknown in greater India. To me complete genocide is unlikely so we'll have to look for an alternative explanation. "I don't think CF came all that much later"
And possibly at the same time. If CT was the Y-DNA that left Africa the four derived haplogroups may have each coalesced in a different region within the haplogroup's geographic range: E in Africa, D in East Asia, F in South Asia and C in SW Asia.